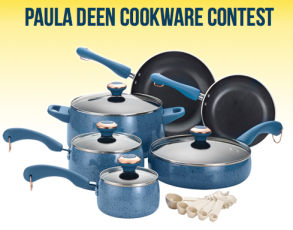 Enter to Win a 15-piece Paula Deen Porcelain Cookware Set! Head over to Sun Sweeps and enter for a chance to win a 15-Piece Paula Deen Signature Porcelain Non-stick Cookware Set! Ends 3/31/13. GOOD LUCK!